A controversial figure and divisive subject. For some, an intense, driven and valiant campaigner for transparency, the equal access to information and constitutionality when it comes to what executive arm of our political practice should and should not do, enabling the community to cast judgement. Publicity seeking traitor endangering lives by disclosing delicate material into the public domain to others. Assange is the founder and editor-in-chief of WikiLeaks, which started unveiling classified data and images, in 2006. WikiLeaks came to global prominence in April 2010 by leaking motion picture evidence depicting US soldiers offing noncombatans from a whirlybird in Iraq, what became known as the Collateral Murder video and Afghanistan war logs, ultimately triggering the United States government launching a criminal investigation and asking allied nations for assistance. Later that year, what followed was Assange being apprehended in the United Kingdom after the issuance of an international arrest subpoena over accusations of improper conduct in Sweden. Subsequently, Assange found sanctum in the Ecuadorean embassy in London, on whose premises he has been living ever since 2012. The conversation with Assange proved that is acutely aware that whatever he and his organisations do, prompts the public to stigmatize him as pro-this or contra-that, yet emphasized that he has no institutional bias and that he perceives it as his role and mission to take on abusers of power. He considers resulting, ensuing controversies as collateral damage worth engaging in. Despite the rising legal and political strains coming from Washington, he continues to publish in a bid to reveal not just individual incidents, but about bigger picture dependencies. His ultimate aim is not to show glimpses by releasing documents but to fully unveil mechanisms, structures and supporting, underlying economic forces that support it. Metaphorically speaking: Sheeding light on the constellations, not merely the stars in isolation to allow the public to read and make sense of the night sky. WikiLeaks has been accused of not curating content and therefore picking and choosing material solely to harm their adversaries. Assange explained that he believes in the rectitude of unaltered information, which is based on having a secure anonymous online submission system to protect the identity of the submittant, and in the benefit of mainstaing collections of documents, which informs WikiLeaks efforts to make it accessible to the public. He underlined that WikiLeaks has a solid track record of having released authentic information – an impressive feat given that WikiLeaks has transformed more than ten million transcripts into a library that can be searched, not only making their website the world’s largest online repository for classified data, but also providing a forum through which individual inciedents can be contextualised. Assange, in his usual composed and eloquent manner, challenged the audience from all schools of thought and philosophical leanings to take serious consideration of journalistic freedom and the implications of a silenced media: Silence is consent and ignorance – be it willing or unwilling – will only lead to someone else taking reign and deciding over you. The evening was hosted by the Australian comedian and member of the satirical media empire The Chaser, whose cultivated inquisitiveness and curiosity steered the conversation. He seamlessly transitioned from delving into intricate and complex topics to trivia about Assange’s life and day-to-day operations at the Ecuadorian embassy, including a cameo of his cat. 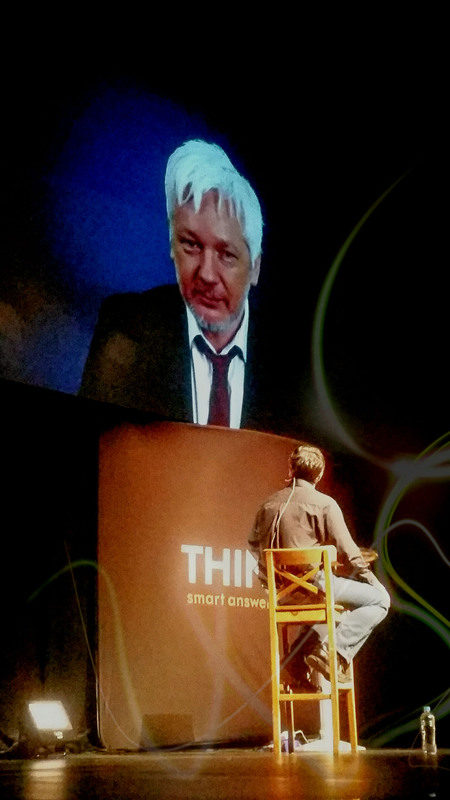 The engaging event culminated in a Q & A from audience members and successfully bridged the gap between inquisitive voices from the public and Assange through dialogue and discourse, which has somewhat become the DNA of Think Inc. in its endeavours to provoke thought and to address the issues of changes that need to be made.